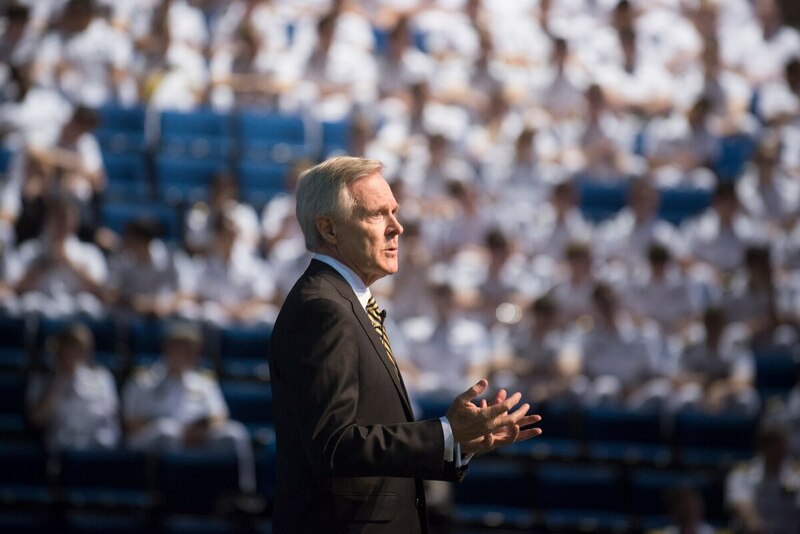 In a speech before hundreds, Navy Secretary Ray Mabus quipped about the grousing some of his initiatives have sparked with the griping some of his initiatives have made for has raised the ire of many sailors and Marines, including top leaders, as he has recently with initiatives that changed traditions that go back decades or centuries, in some cases. He veered off of his prepared remarks at the annual Surface Navy Association symposium on Thursday to tell an anecdote about World War I Navy Secretary Josephus Daniels, who famously banned alcohol in the fleet. It was Daniels for whom sailors and after whom sailors subsequently renamed their next-favorite beverage: "Cup of Joe." "I am trying my hardest not to have a similar expression named after me," Mabus told an audience of hundreds outside Washington, D.C.
Mabus has said he believes he will be replaced when a new president takes over in 2017. The biggest controversy arises from the recent bones of contention have come from the final integration of women into the Navy and Marine Corps’ last all-male units. Through a series of memos over the past weeks, Mabus has orderedcalled the two services under his authorityresponsibility to put together their plans. Part of that integration will include desegregating the Marine Corps' uniquely gender-separated boot camp, a set-up the service has said contributes to a more open training environment, cultivation of role models of the same gender and fewer distractions. Mabus could not say whether an integrated boot camp will mean that recruits just train together or also sharing berthings. "There is a process that is being worked through at the DoD level for implementation," he said. On the Navy side, he has asked Naval Special Warfare to finalize its plan for integrating women into the Navy SEALs, and to the fleet at large, he has asked for a review of gendered job titles. The Navy has a long history of reworking its ratings — for example, merging the personnelman and distributing clerk ratings into the personnel specialist title in 2005. But for even more basic titles, such as seaman, airman and fireman for the E-2 and E-3 paygrades, Mabus told Navy Times that it's too soon to discuss any changes. In what's expected to be his final his final SNA speech, he laid out a list of accomplishments by the Navy during his tenure, from reducing energy use to opening opportunities for women and — key to his legacy — his drive to increase the fleet’s size. He derided critics who claim that the fleet is shrinking, or who say ships counts from decades ago a hundred years ago to compare to what the Navy needs today. "Yeah we have fewer ships that we did in [World War I], but we also have fewer telegraphs than we did in [World War I]," he joked. That misconception does a disservice to sailors, he added, while undermining our allies' confidence and emboldening enemies. "The 84 ships that we will have under contract by the end of this fiscal year is a resounding success," he said. Following his remarks, Mabus addressed the condition of the 10 riverines captured by Iran earlier this week and returned the following day. "They appear to be in very good shape. We've been in touch with all their families," he said. "We'll know more as they're debriefed."